Provide comfort for the family of Shirley Nelson with a meaningful gesture of sympathy. Westfield - Shirley Nelson, 94, passed away peacefully on Saturday, January 26, 2019 at Genesis Westfield Center. Born in Brooklyn, NY to Thomas and May Thompson, she was raised in Springfield Gardens, NY before moving to Pelham Manor, NY in 1949 and settling in Westfield in 1962. Shirley attended the St. Luke’s School of Nursing, graduating in 1946. She was a longtime member of the Presbyterian Church in Westfield, the Westfield Historical Society and the Clark Historical Society. She was predeceased by her husband, Parker Nelson; and is survived by her son, Martin Parker Nelson and her daughter, Susan Nelson Palma; as well as her grandchildren, Brian Nelson Palma (Laura) and David Charles Palma (Kristen). Family and friends may gather at the Dooley Colonial Home, 556 Westfield Ave., Westfield on Wednesday at 11AM, with a prayer service to begin at 11:30AM. Interment will follow at Fairview Cemetery in Westfield. In lieu of flowers, donations may be made to Guideposts Foundation, Suite 27, 39 Old Ridgebury Road, Danbury, CT 06810. To sign the online guestbook, visit www.dooleycolonialhome.com. 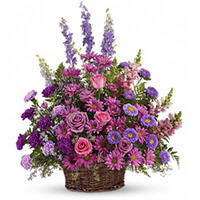 To send flowers in memory of Shirley T. Nelson, please visit our Heartfelt Sympathies Store. Richard Lasota & Celina Dynak sent flowers to the family of Shirley T. Nelson. Deepest sympathy to the Palma family for your loss. Richard Lasota & Celina Dynak purchased the Gracious Lavender Basket for the family of Shirley Nelson.